Last night Keith Nelson of the Bindlestiff Family Cirkus made history. For years, Keith has attempted a trick called the Kendama Blockhead without success. Kendama, for those who don’t know, is a Japanese toy involving a cup and a ball attached to a string. The term “blockhead” refers to the art of shoving long pointy objects up one’s nose. The premise behind the trick is simple. Keith shoves the kendama up his nose, then flips his head up and catches the ball on the cup. For two years, Keith has failed to complete the Kendama Blockhead. That is, at least, until last night. 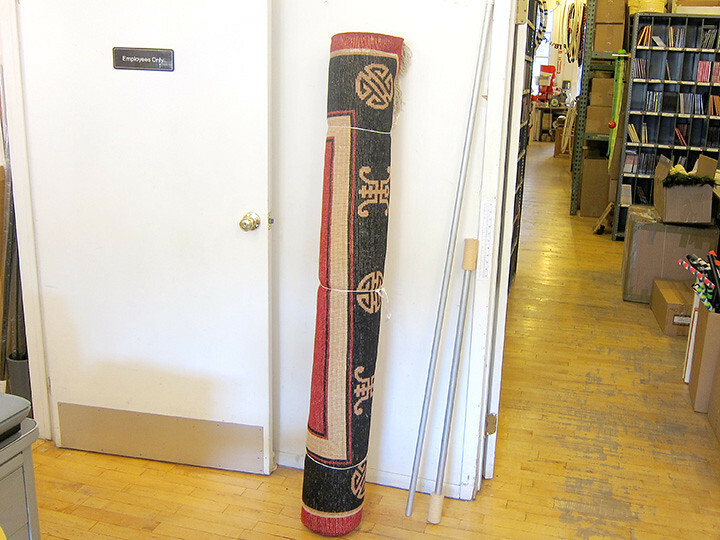 Hat tip to Jim Moore for all his dedication in documenting the variety arts in New York City. Kendama Blockhead Completed by Keith Nelson from Jim Moore on Vimeo. Video Friday: 10 Ball Flash on Dubetube! Earlier this week we encouraged you to send us your juggling videos, and send us your best. Jason Donnelly immediately submitted his 10 ball flash, 3 ways. Watch it, believe it, and send us your videos if you can beat it! Hey Ma Look at Me Juggle! We like watching your videos, we like sharing your videos, and we LOVE it when you juggle with our equipment. Our YouTube pages have received over 100,000 views in little more than one year. Send us your juggling videos and receive a 20% discount off your next order plus your video may be featured as a demo on our website. Be sure to follow the guidelines below and submit them to www.dube.com/dubetube. – We need videos of your contact balls, ball poi, kite poi, sock poi, meteor, whips, hat manipulation, roping, unicycling, scarf juggling or hooping with your Troo Hoop. – Make a tutorial. How did you learn to ride a unicycle anyways? Show us! – Comedy and paradoy, did someone say fishigi…? – Flash your best stuff, you know everyone else will. – Use any equipment from the Dubé catalog or equipment not easily recognizable as another brand. – Videos must contain your original juggling, tutorials, goofing around, but no copyrighted music. Some excellent sources for music are: Musopen, CCMixer, Jamendo, and Istock Audio. – Videos must be 30 seconds to 5 minutes long, preferably 2-3 minutes, and no larger then 50 MB in size. – Read all the details here. 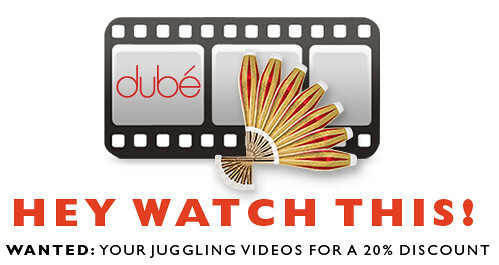 Discounts will be given for each video after reviewed by Dubé Juggling for guidelines. Multiple discounts cannot be combined — each discount is applicable to one order only. Discounts may not be used with other offers. Videos must be submitted through our uploading site. Videos that are emailed, linked to, or sent via Facebook, Twitter or other sites will not considered for a discount, but we will enjoy watching them none-the-less. David Bowie’s “The Labyrinth” was the first time many of us were exposed to contact juggling. In the movie, Bowie’s character Jareth the Goblin King appears to manipulate a clear acrylic ball. In reality, it was not Bowie but juggling legend Michael Moschen doing the manipulation. We stumbled upon this classic behind-the-scenes video featuring a young Michael Moschen (check out that head of hair!) while researching the Fushigi controversy. These were truly the early days, before the term “contact juggling” was even coined. What you’re watching here is “crystal ball manipulation”. 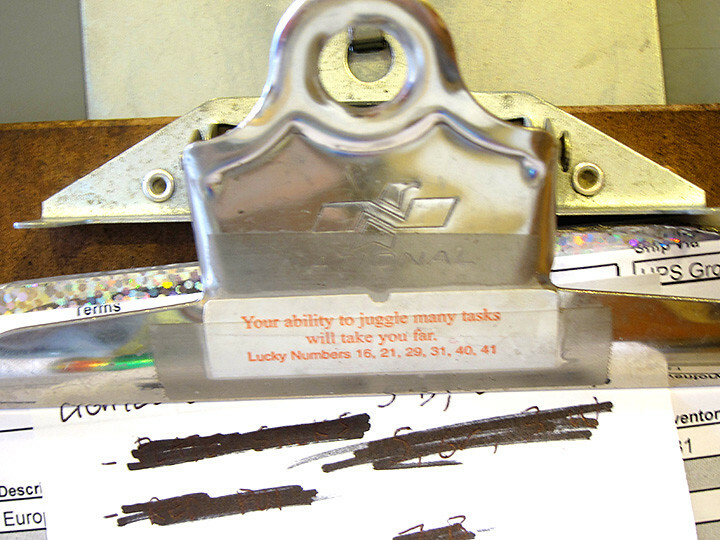 Brian Dube has been in business since 1975. The current store/office/warehouse/manufacturing/shipping mecca on 520 Broadway has been home to Dube Juggling and now Troo Hoops since the 90’s. Time enough to find lots of great juggling relics and office-stuff-ola that make for a pretty fun atmosphere to work and be around. Here are some shots of my favorite micro moments around the office. 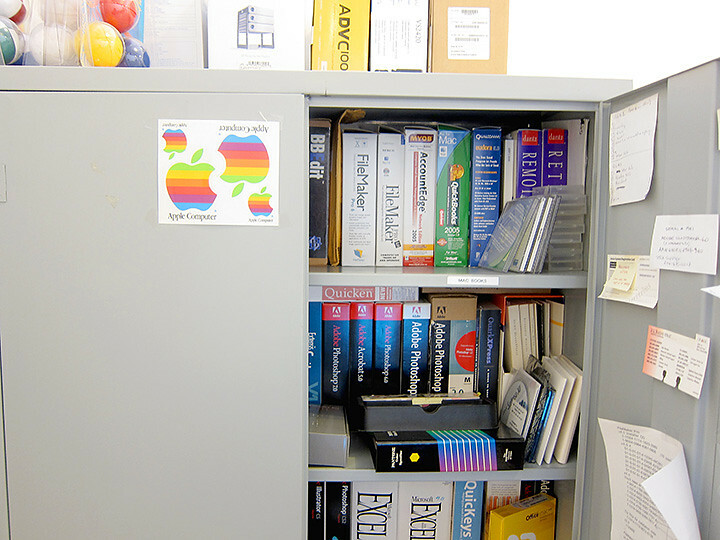 Note: I didn’t even touch the files, which are filled with more great history of the company and juggling in America and beyond. 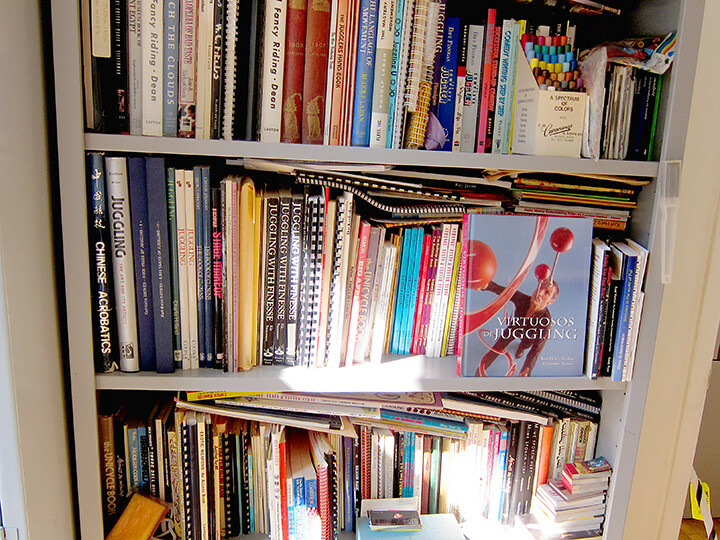 Brian Dube's bookcase contains years of books about juggling, manipulation, and circus, including old versions of our own books. 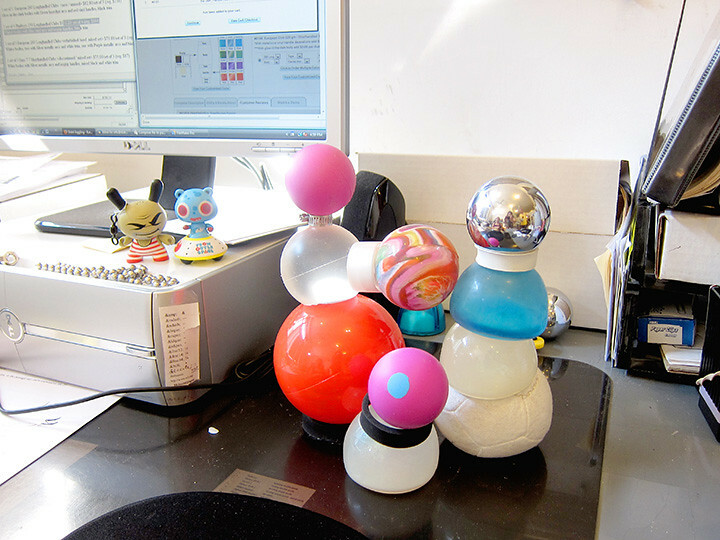 All the desks in the office are decked with toys, samples, and odds ends of balls. I like to bounce balls when I'm thinking, which I imagine drives the neighbors bonkers. 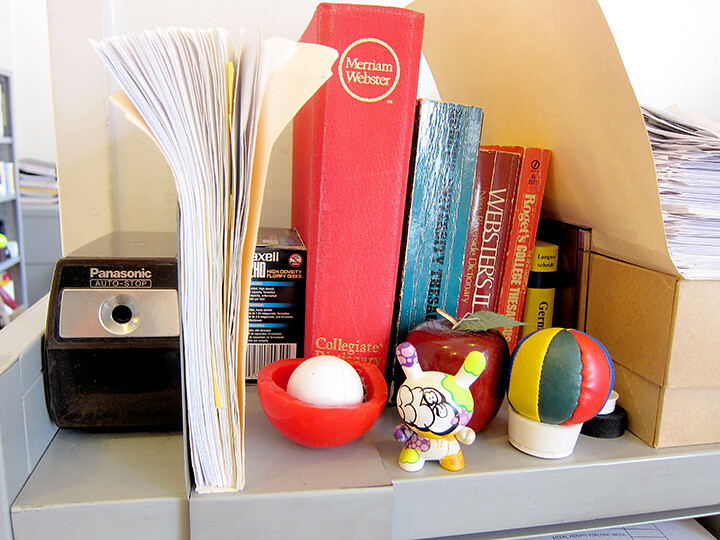 The office may not employ the best jugglers but we are experts at balancing. 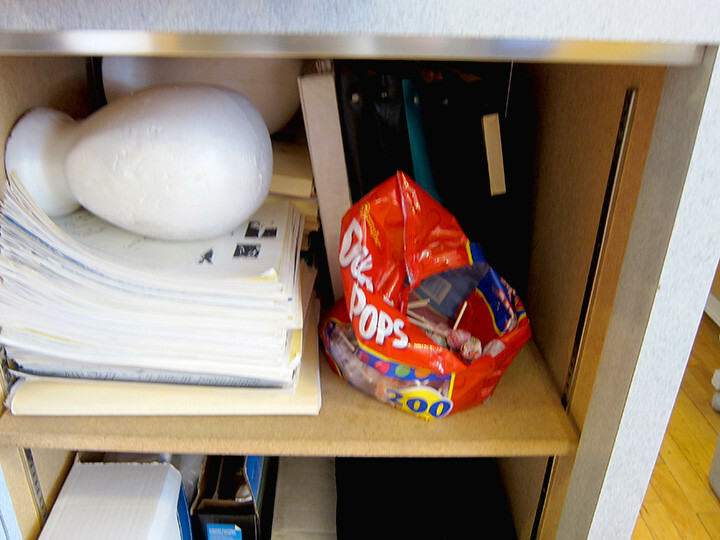 The candy drawer is the highlight of everyone's day. Reasons: sugar and the styrofoam head. It's nice to get the cliches out of the way when you work at a juggling equipment company. We've heard them all, but this fortune does say it nicely. 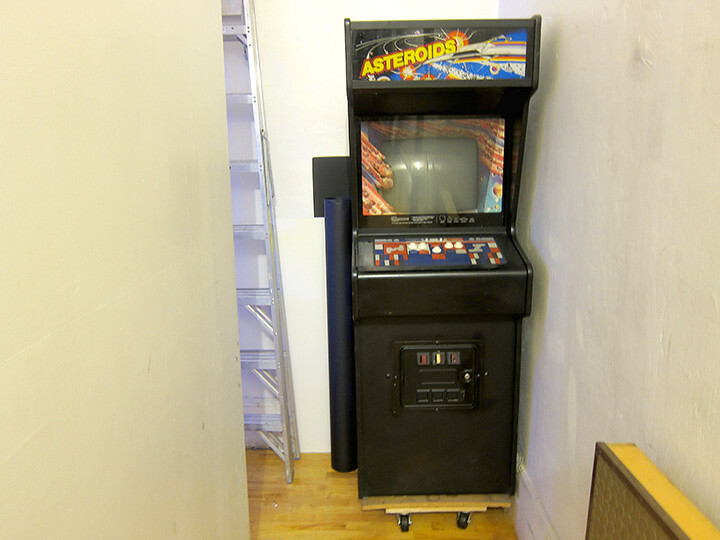 The Asteroids arcade game is an original. 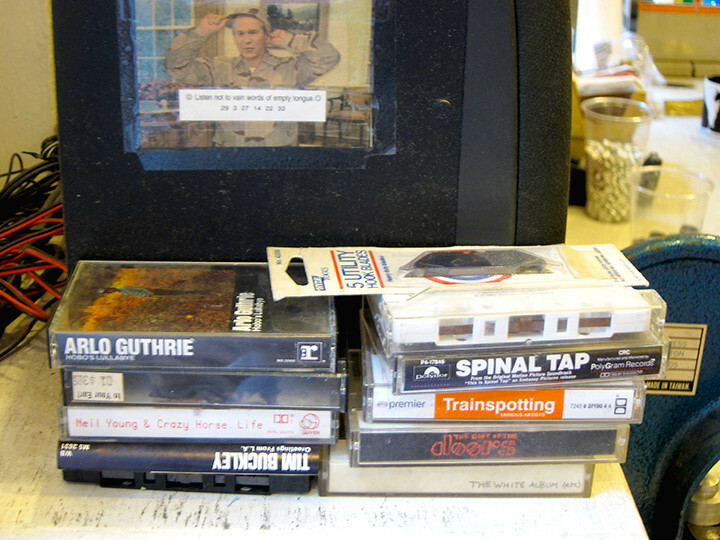 Brian bought it in the 1980's after he found his friends addicted. The machine used to inhabit the first Dube office on Park Place where Michael Moschen, Fred Garbo, and Bob Berky used to play it. The last time I can remember it being turned on was when "Get the Shoe" visited in 2008. A poster dating back to the early 80's. 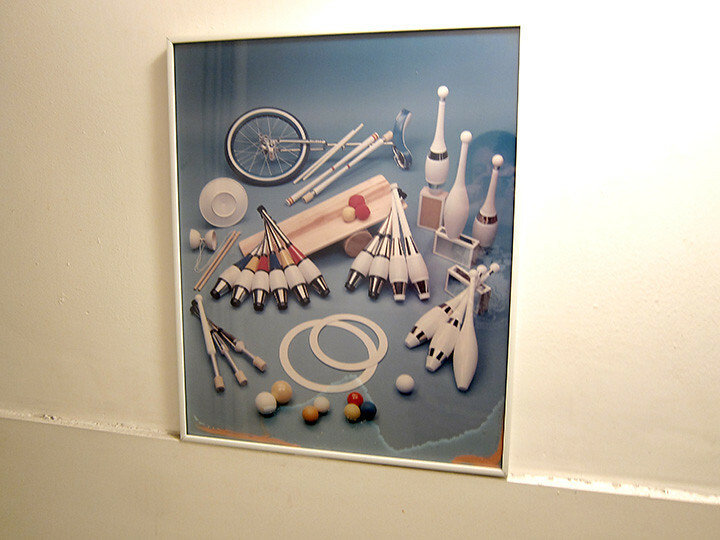 Before Dube Juggling printed a catalog this poster would be folded up and sent out with brochures and price lists. Now the poster decorates our bathroom. Its always a party in the back where production and assembly happens. 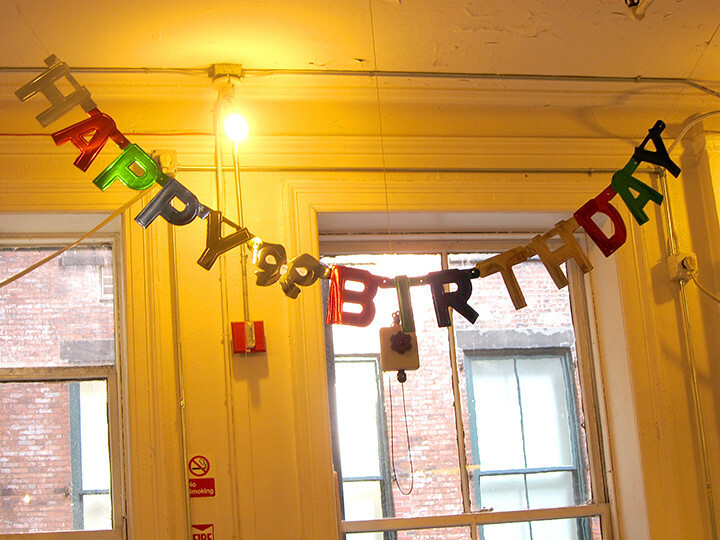 This banner has been hanging up for at least 5 years. Production people come and go, but they all like to ROCK! I'm a little jealous that the workers in the back get to play music aloud while they assemble your juggling equipment. Rather than develop a truly innovative product or genuinely improve on an old one, we have co-opted contact juggling, made cosmetic changes to the ball, repackaged and branded the whole thing. To excite the customer, we have videos of highly skilled jugglers demonstrating illusions in a way that make the product look self working. So much so, that caveats are needed in the FAQ. To patronize the truly outraged in the CJ community, we have buried credit to Michael Moschen’s work at the end of our FAQ. Can any one do this? Tell me more about Fishigi and why its different from anything else? How is this ball different from other acrylic balls? 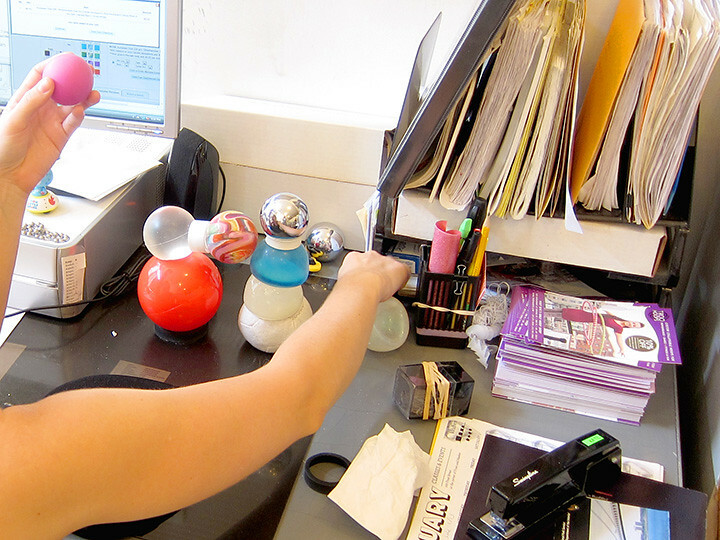 Most acrylic balls are manufactured in the same factories in China. So we have manufactured the Fishigi as two balls in one – a standard outer acrylic ball and an inner reflective ball for marketing purposes. What size Fishigi should I buy? It doesn’t really matter since your frustration will outstrip your patience. Your ball will soon join other unused products in the back of your closet. What are the minis for? Since discouragement defines the contact juggling experience, smaller balls are easier to pocket or put away. What do I do if my Fishigi gets scratched? Do not worry. In a world oversaturated with contact jugglers, no one will be watching you. Does Fishigi actually float on its own? Contact Juggling (also known as Useless Manipulation, Here and There Play, Bore Rolling, Hysterical balancing, Nofishigi etc. The art form was created by Michael Moschen in the early 1980s and aped ad nauseum since that time. FUSHIGI is a brand new, dynamically designed ball used in the mysterious art of contact juggling. With FUSHIGI the operator exploits the reflective properties of a sphere through specific hand and body isolations and movements that are designed to give the appearance that the FUSHIGI sphere is moving on its own or even floating. Using FUSHIGI is an incredible, therapeutic form of relaxation. The art of maneuvering a reflective sphere through mind and body isolation and manipulation creates the illusion that the sphere may be defying the laws of gravity, as if the sphere is moving on its own. 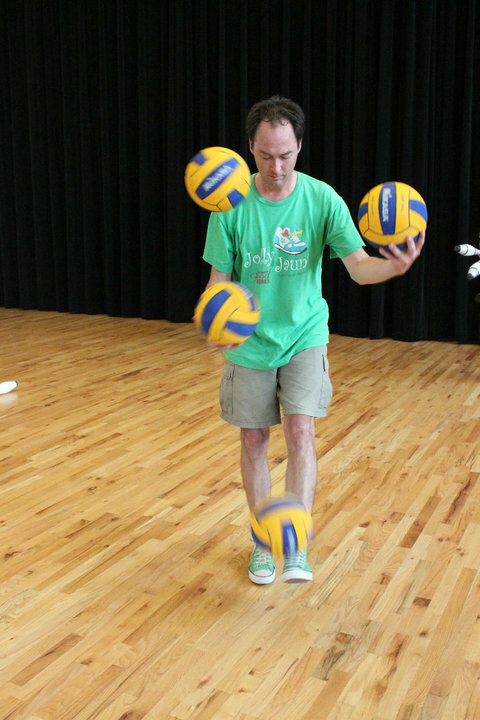 According to Brian Dubé, controversy is nothing new in the world of contact juggling. Michael Moschen, recognized as the godfather of modern contact juggling, famously became outraged at James Ernest over a book that Ernest had published. Moschen claimed that the moves he had developed were his own intellectual property, and that Ernest was, in essence, stealing his material. Moschen even went so far as to threaten to boycott the IJA convention in Montreal in 1992 because the IJA had published a review of Ernest’s book. Moschen’s position has mellowed since then, and while he’s not thrilled with products like the Fushigi, he isn’t nearly as outraged as he has been in the past. That doesn’t mean the controversy is over. Many contact jugglers are upset by the infomercial’s implication that the ball is somehow “magic” and that in just a few minutes, anyone off the street can master the Fushigi. This product isn’t “new”, as its makers claim, and we’re not exactly sure how the operator “exploits the reflective properties of a sphere”. Contact juggling is an extremely difficult skill, and many of the maneuvers demonstrated in the advertisement can take years to master. We’re happy that Fushigi has helped bring the art of contact juggling to a wider audience, but we feel their approach is a little dishonest. Have your seen or tried the Fushigi Ball? What are your reactions? Please let us know. Bruce Sarafian is an accomplished juggler and world record holder. When he’s not challenging Anthony Gatto’s records, he’s busy clowning around with some juggling torches. Burnsclinic, out of the UK, shows off some fancy fire staff manipulation. Marcus Monroe is known as the godfather of the modern juggling knorch. What is a knorch, you ask? A knorch is a torch and a knife taped together. Marcus doesn’t just juggle knorches, however. Instead, he puts a firework helmet on his head, and rides a 12 foot unicycle while juggling knorches. In observance of Independence Day, we will be closed Monday, July 5th. Please enjoy this video of a man and a monkey juggling. See you at the beach!